My sister and I got together this past weekend to fancy up a few pumpkins for the season! 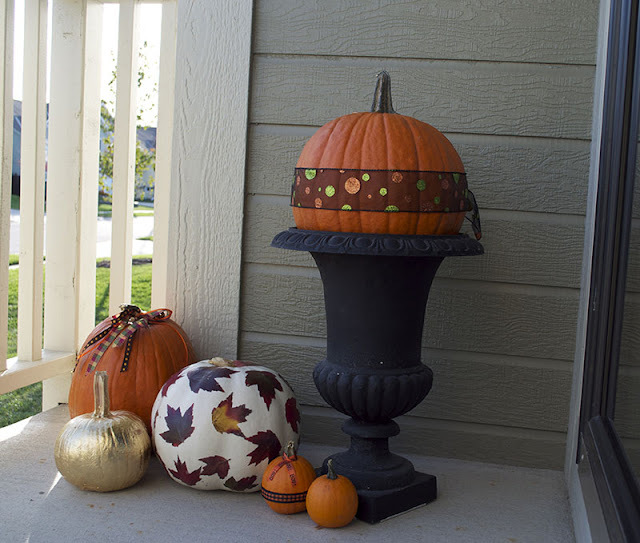 I love to decorate with pumpkins and mums. We gathered up our supplies of a fun filled afternoon of glueing, mod podging, and all around fun! 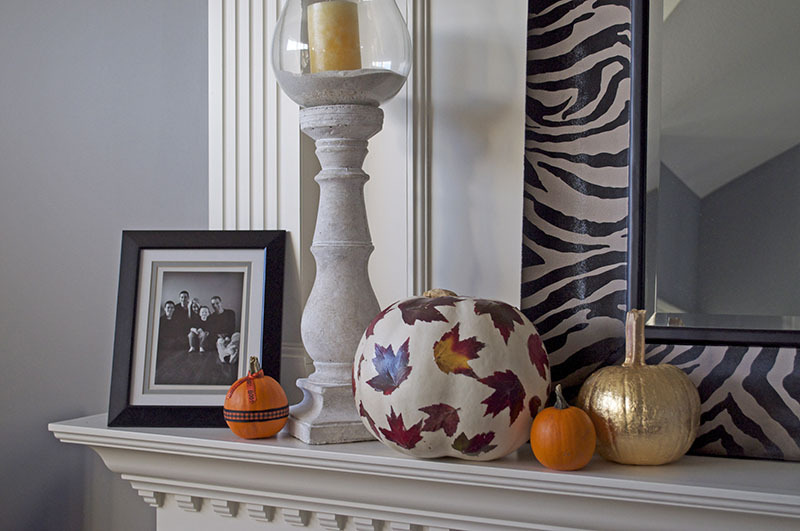 I love to decorate for fall around the house and this was the perfect start to the decorating! First up is the gold foil pumpkin adventure! I say adventure because it was a sticky experience! I can honestly say I love the way it turned out, but the spray adhesive was a challenge! I purchased a package of gold foil at Hobby Lobby. I already had a can of leafing spray adhesive from another project. 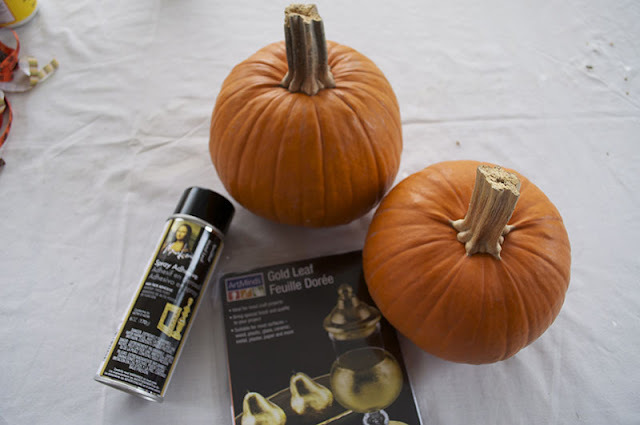 We sprayed the pumpkins with the adhesive and proceeded to place the sheets of foil on the pumpkins. 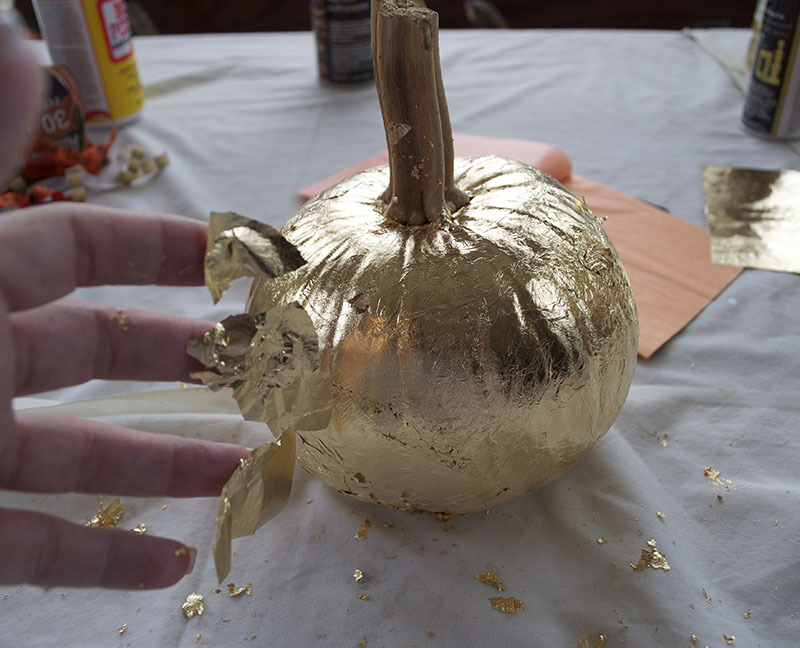 As you can see, my fingers must of had some adhesive residue, because my fingers were covered with flecks of gold by the time this pumpkin was done! 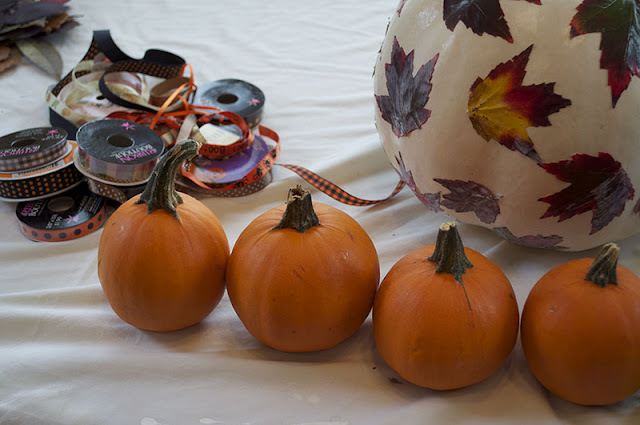 Next up, was the mod podge pumpkins. We gathered leaves and pressed them in a book the weekend before thinking that they would be nice and flat ready to stick to our pumpkins....... wrong! They were dry and flat, but not not really adhering to our pumpkins well. Thats when we changed it up. We gathered new leaves off of my sisters flaming maple tree she planted in honor of our sister Donna. They were beautiful in oranges, reds, and greens. 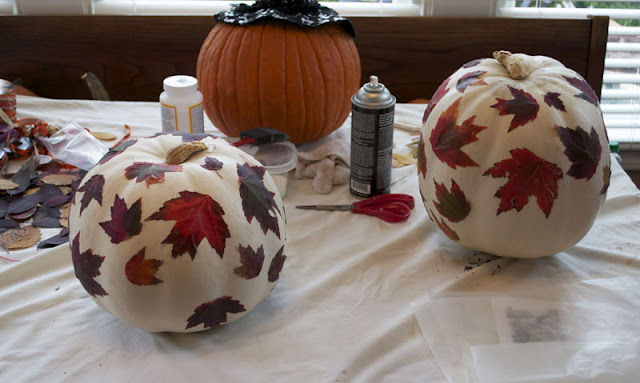 We sprayed the backs of the leaves with spray adhesive and randomly placed them on our white pumpkins. We then sealed the leaves with our mod podge. And finally, a bowl full of baby pumpkins! We used dot adhesive, you know the kind you scrapbook with, and decorated these little babies with ribbon! We are having Thanksgiving in Kansas City this year with all our family from Oklahoma, and my sister Mary and I couldn't be more excited to be hosting it in our city! We will be decorating our tables with these for sure. So what do you think? Have you started any fall DIY projects? These pumpkins are too cute!! Ohhh, thanks. They were super fun to make too. 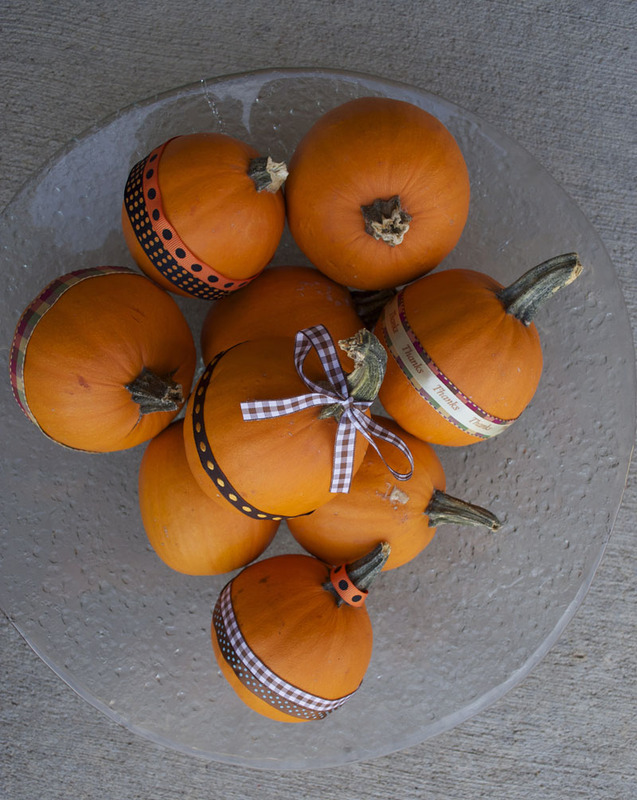 i need to DIY myself some pumpkins FAST -- time is running out! & these turned out fabulous! Love the leaf pumpkin, I havn't seen one like that before. 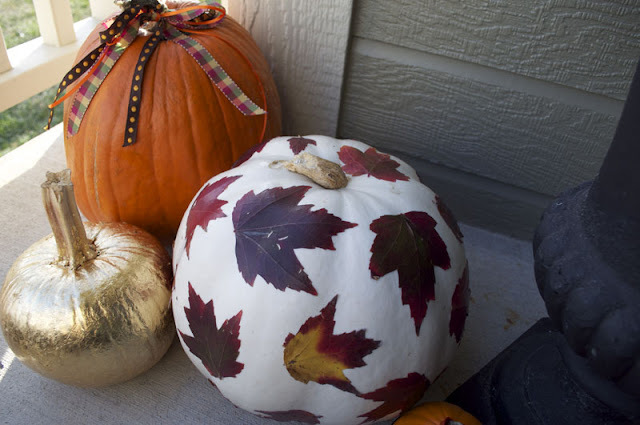 I had seen it done with brown leaves, but I really like the way the reds pop on the white pumpkin.